Valley of Flowers is one of the magical wonderlands on earth. 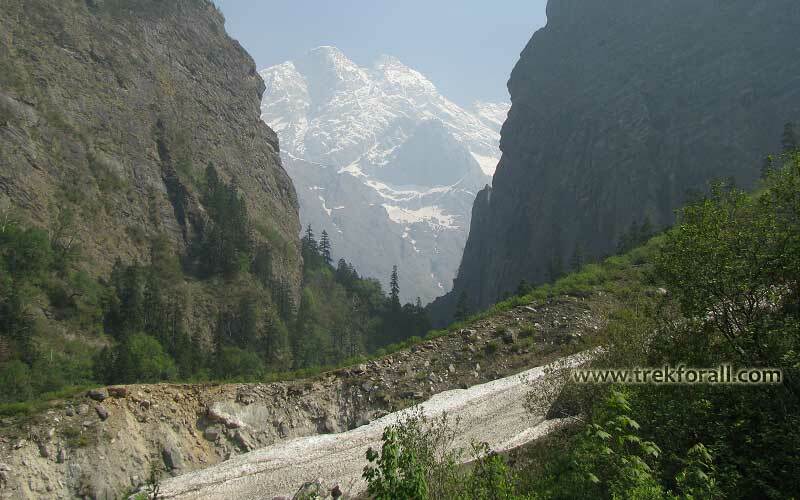 It is situated in western Himalayas at a height of 10500 to 12000 feet, in the state of Uttrakhand, India. 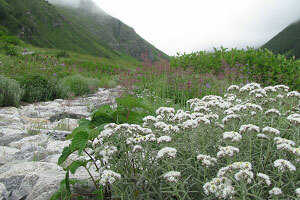 Discovered by Frank S. Smyth the Valley of Flowers is snow covered for much of the year and hence remains inaccessible. It is accessible for about four months in a year. (From June to September). 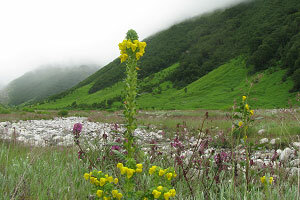 The Valley of Flowers was declared a national park in 1982. In the year 2005 it was declared as a world heritage by UNESCO under nature category. 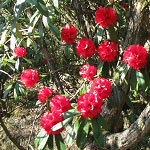 There are about 650 types of different plant species found here. These include some of the very rare plants like Ladies Sleeper Orchid, Blue Poppy, and Braham Kamal etc. 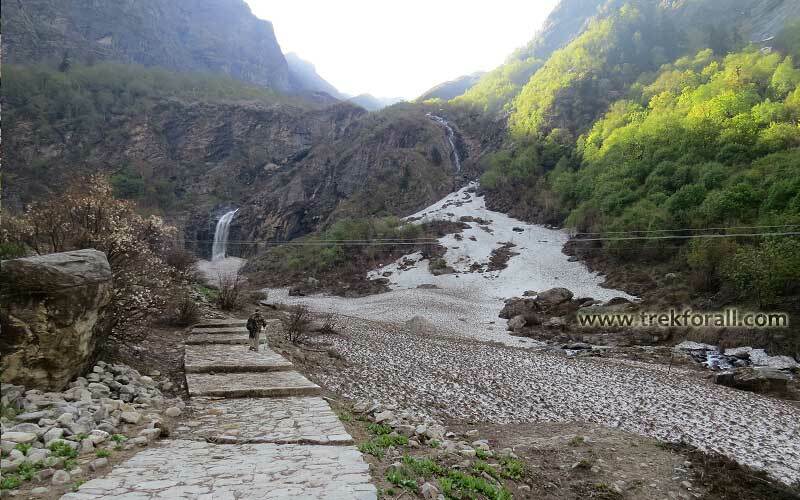 You will find a dense forest of Bhoj Patra also in the Valley and on the other side of Pushpawati River. Valley of Flowers changes its colors almost every day. If you visit the Valley repeatedly every week you will find different color of valley every week. To feel this effect kindly watch pictures below which are taken in different months. People from all over the world come here to see this majestic natural beauty. 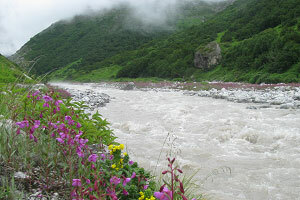 Valley of Flowers in July, Pushpawati River bed, the pink shed is Epilobium Latifolium flower. 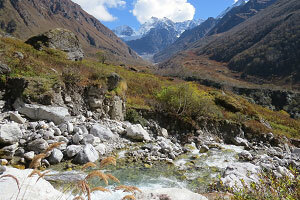 Valley of Flowers in four different seasons. The Valley is snow clad for much of the year. In the month of April snow starts melting and seeds germinate by June. 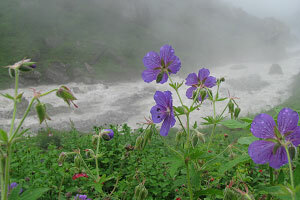 By the mid July, Valley of Flowers is in full bloom. 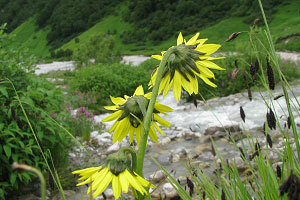 Valley remains in full bloom till mid August and after that the plants starts maturing. 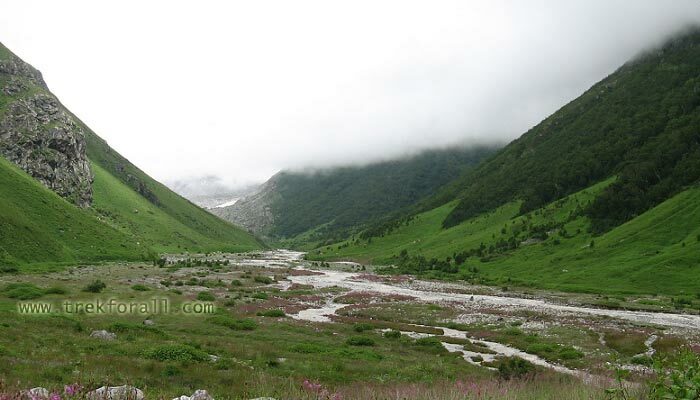 By the end of August the color of the valley changes from lush green to peach green color. 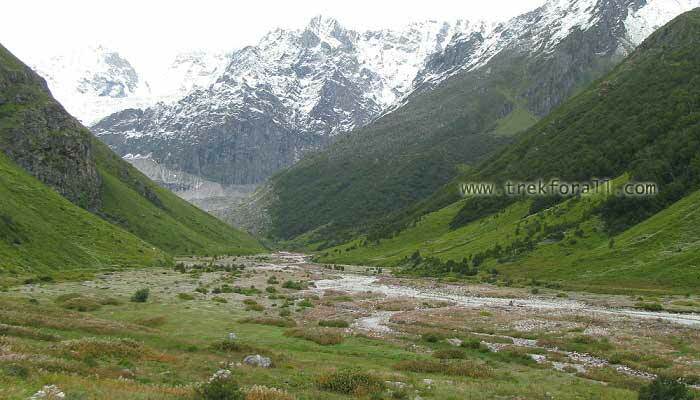 By September, Valley of Flowers changes its color to more yellow and brown and slowly the green shade vanishes. By September last week most of the flowers changes to seeds and berries. Even berries of most of the flowers are very beautiful. Beautiful waterfall near Ghangaria,you can see Glacier also. 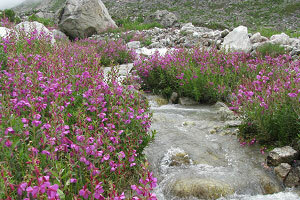 Valley of Flowers National Park is Situated near Badrinath, in the state of Uttrakhand in India. 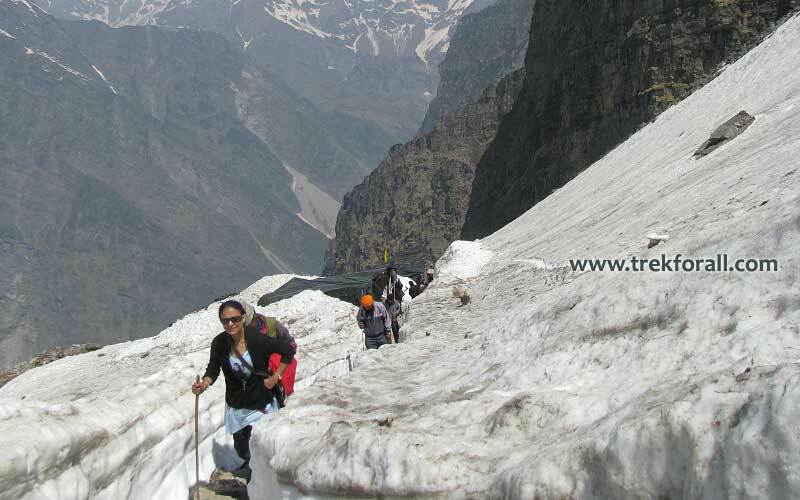 It is at a height of 11000 feet to 14000 feet above sea level in western Himalayas. 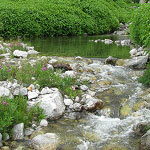 It is famous for its meadows of alpine flowers and outstanding natural beauty. 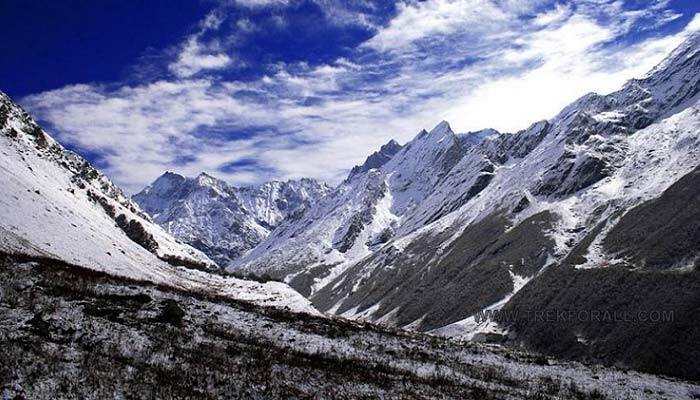 Valley of Flowers is snow covered for much of the year and becomes accessible in the month of June and remains accessible till October first week. In the month of June when snow melts the seeds put down last year by the plants starts germinating. Earlier plant include Primula, Blue Corydalis and Iris. 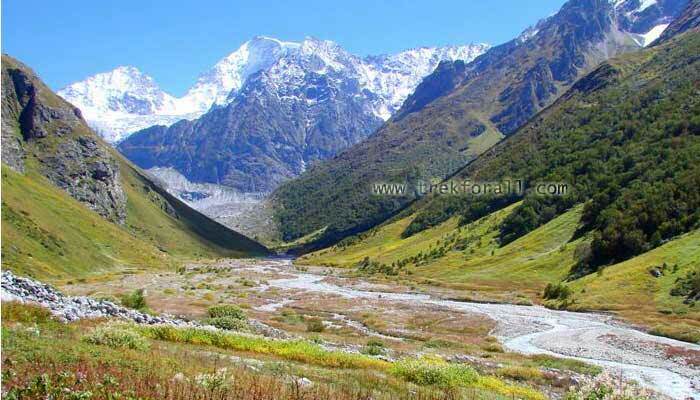 Detailed analysis of what is the best time to visit Valley of Flowers with pictures and videos of the valley in different seasons. Valley of Flowers is accessible only for four months in a year and changes its colors, weather and the flowers very rapidly in these four months so it is very important to know what is the best time to visit Valley of Flowers. Detailed list of things to carry on your trek to Valley of Flowers, if you miss even one important thing on your trip you life may become hell. 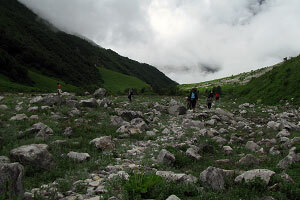 You are going on a trekking trip and in a very remote area so a must read for every one willing to go to the Valley of Flowers. 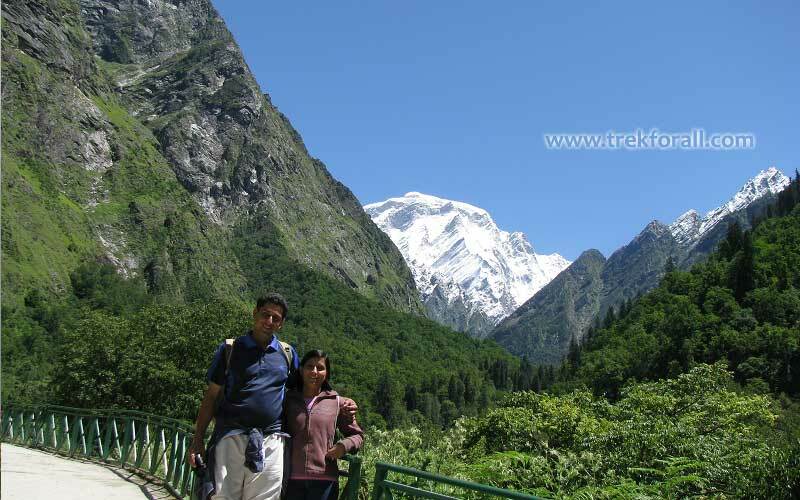 This is a Travelogue written our client Dr. Tapan Charkrobarty who was 63 years of age when he went with us to the valley in August 2012. A live unedited version of his experience with us. He is an Emeritus Scientist with CSIR-NEERI at Nagpur. You will like to read his experience. 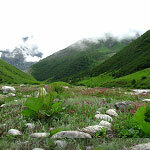 You can book a hotel in Ghangaria from us for your trip to Valley of Flowers. Prices of the hotel rooms are available here. Pictures of the hotel have also been given. You may find this page helpful if you are not taking a package and going of your own. Here is the blog of the author of this website. You can browse through is posts written on various dates. 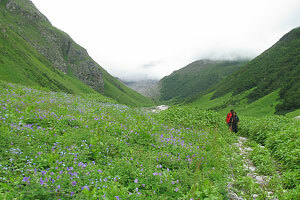 These posts have helpful content for planning your trip to the Valley of Flowers. There are many questions asked by visitors on our site, some of the common and important are answered here. There are some important questions which are important but you may not even think of them are also given here. For eg can you bring your kids to the valley ? Read through this page to know the answers of all of them. 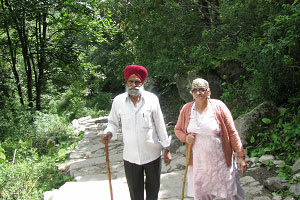 Can Senior Citizens visit Valley of Flowers ? There are many senior citizens willing to come to the valley, whether they can come and what are the precautions they should take before coming here? 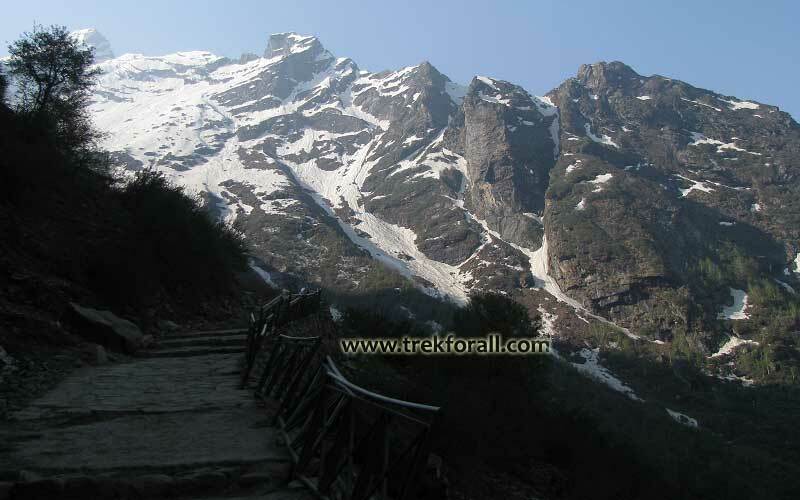 What are the various options available to avoid trekking and where these options are available? If someone is a senior citizen in your group please read this page before planning to come to the valley. Appropriate type of shoes are very important for your trip to the valley. Detailed explanation of the appropriate type of shoes for the trip is given here with pictures of terrain. 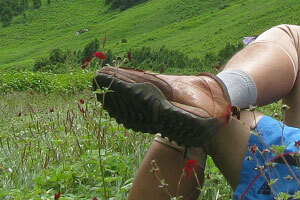 The season in which you are going to the valley is also an important factor to decide the right type of shoes. 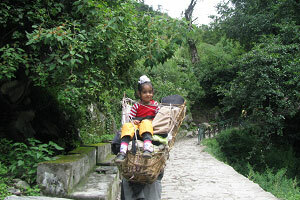 There are many couples who want to come to the valley but their child is too young. 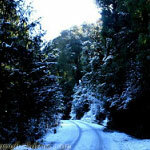 This page explains the minimum age to visit the valley. Should you bring your kids to this trip? What are the precautions to be taken on this trip if you bring your kids? 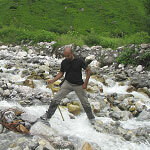 Most of the tour operators and individual going to the valley have only one day for the valley in their itinerary. Is one day sufficient to see the valley entirely or you need more days? We take you to the valley for two days. Check out the reasons why you need two days for the valley with pictures of what people do on first day? 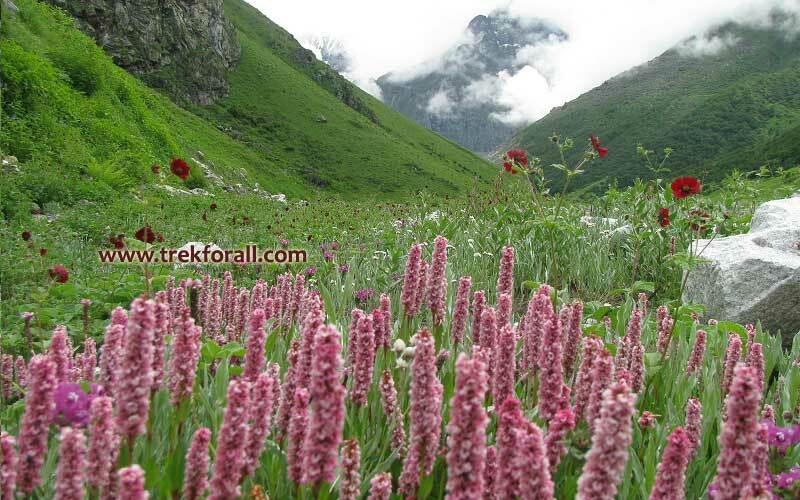 Valley of Flowers trek requires one to trek for minimum of four days. 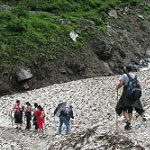 This page explains the difficulty of the trek on these different days. 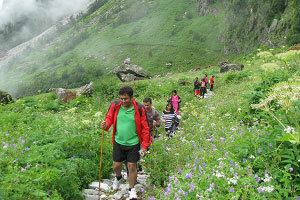 What are the other options available on these days to skip trekking? 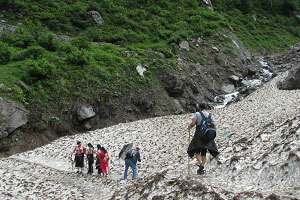 Can a first time trekker do this trek? There were massive floods in Uttarakhand in June 2013. Devkant Sangwan has been to the valley after the floods and clicked the pictures and videos of the valley after the floods. Many websites say that the valley has been washed away in the floods but it is totally a false and irresponsible statement. Read this post with many pictures and photographs of the valley taken in October 2013. I am a great lover of nature. 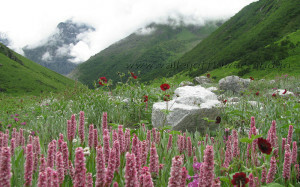 I want to visit the Valley of Flowers and Badrinath. I want to know the prices. 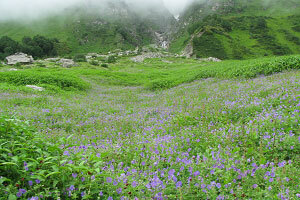 I would like to see Valley of Flowers in the month of May .Will there be any flowers at that time. please let me know. 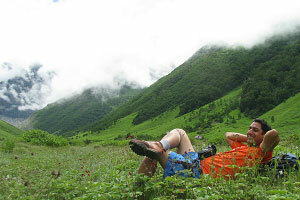 I would like to visit Valley of Flowers this year in Jul with my wife and spend 2 days. 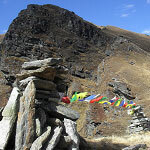 I\’d also like to visit Tungnath. Please let me know if you can arrange this. 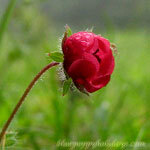 I am from Hubli Karnataka.Valley of Flowers is just my dream and I love to visit the place. I am single woman age 47 and my right side is handicap but very active and independent. I want to know your traveling rules regulations along with your price. let me know your travel.